Last week I was invited to give a talk, where I discussed nutrition and physical activity and the minimum requirements for the average person. 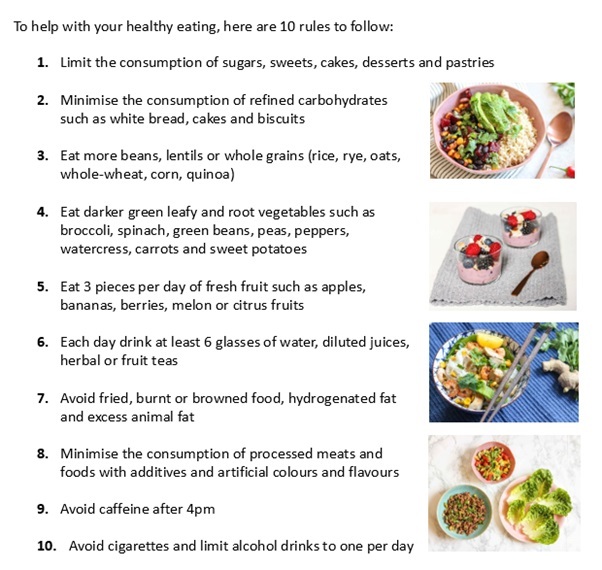 We’ve written several Body Happy blogs discussing the guidelines set by the government with regards to looking after ourselves, and you can read them here. The guidelines are the minimum we should do to look after ourselves. How many of you charge your phone every night? But what about recharging you? How many of you manage the recommended 8 hours sleep each night? Sleep is us putting ourselves onto charge. Sleep is important as it allows the body to repair itself: our muscles, heart and blood vessels. Lack of sleep has been associated with an increased risk of heart disease. 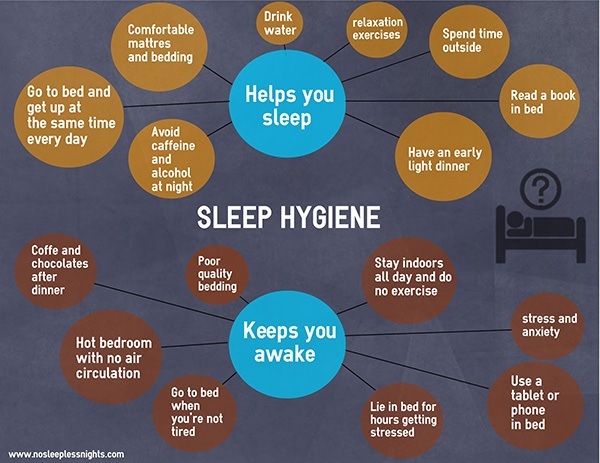 If you find it difficult to get to sleep, try getting into a routine before bed. Does your phone take longer to charge if you have it plugged in and you keep using it? Your body works in the same way: you maybe in bed, but playing on your phone, or watching TV is not fully switching off. Do you have virus protection on your computer? Of course you do, and you want to reduce the risk of catching bugs. Do you virus protect yourself? 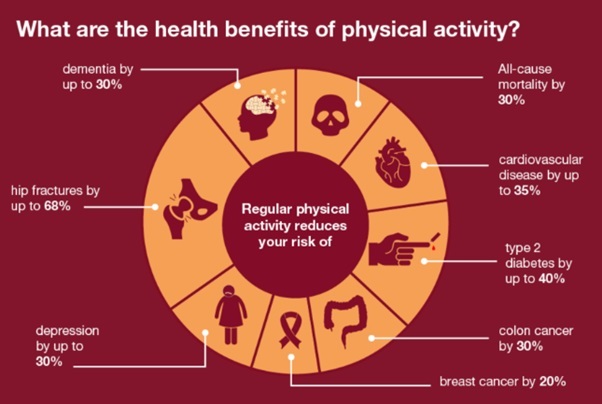 Do you carry out the minimum physical activity guidelines to reduce your chances of catching a disease? The guidelines recommend by the government consists of doing 5 x 30 minutes moderate activity or 3 x 25 minutes of intense exercise weekly. These bouts of physical activity can be broken into 3 x 10 minute periods in the day – 10 minutes before, during or after work. Breaking exercise up into shorter intermittent bursts had the same positive effects on mood, fat loss and health as 1 x 30 minutes daily. What fuel do you put in your car? Would you put diesel in a petrol car? Petrol in a diesel car? Why not? If you put the wrong fuel in what happens? The engine stops working, it slows, it splutters along, the engine gets clogged up (like your arteries!) and eventually breaks down. Food – fuel – is important, not each calorie is equal and not each food is equal, the same as petrol and diesel – you can buy premium which is better for the engine. A balanced diet is needed to provide you with the essential nutrients which are vitamins and minerals – which are better for your body. Our body needs these to help provide us with energy, to function and fight off diseases. How often do you drive your car? If its been sitting still for a period of time do you take it for a spin to turn the engine over? Why? Your body is the same, if we have been sitting still our body starts to switch off, the battery starts to drain, the same as a car. Sitting slows our metabolism, it decreases our ability to regulate blood sugar, decreases the body’s ability to metabolise fat and it decreases bone and muscle strength. Even if you are active in the morning, sitting for the day can still have negative effects on the body. Throughout the day, the same as you would take a car for a spin, you need to take yourself for a spin. Research has shown that standing and moving every 30-45 minutes is great for our health, as by getting up and moving we awaken the metabolic system which increases the good cholesterol, keeps the fat burning enzymes switched on and results in better insulin levels meaning better responses when we eat. Why is this important to health?